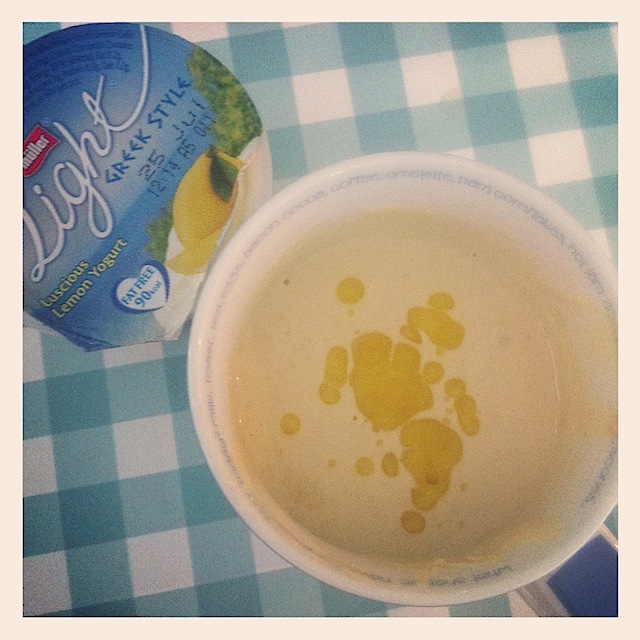 Lemon yogurt is one of my favourite flavours because it’s flexible to use in non-sweet dishes as well as more obviously dessert or breakfast. I have marinated chicken in lemon yogurt to great effect and during the current heat wave we have enjoyed a cooling salad dressing made from Muller Light Greek Style lemon yogurt. Mix 2 tablespoon of yogurt and 1 heaped tablespoon of tahini with a fork in a mug. Add seasoning and an equal volume water and mix well. Drizzle with some olive oil and spoon over salad leaves, it’s especially good with rocket. If you make a mug full you’ll have enough for a couple of days. Someone asked me on Facebook whether using a sweet yogurt meant this dressing was sweet. I don’t think so, the texture of the tahini balances it out fine. What’s your favourite instant salad dressing?